Needle crafters who want to learn how to make ribbon crochet headbands can find a wealth of valuable instruction on the Internet. It's easier than ever to learn crochet projects due to the influx of quality online crafting communities and resources. 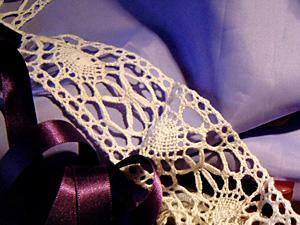 There are several interpretations of ribbon crochet, depending upon who you ask. For most people, ribbon crochet means incorporating strands of pliable ribbon into certain projects, but the term also refers to adding ribbon accents to finished crochet pieces or crocheting with one of the many popular varieties of ribbon yarn currently on the yarn market. Below you will find crochet tips and instructions on how to create headbands using all three interpretations. Despite the resources made available through modern information-sharing technologies, it's often a chore for people to find specific crochet projects among the multitude of patterns. The sections below provide listings that include a wide variety of links that will teach you how to make ribbon crochet headbands. A good way to start your search for the perfect headband crochet project is to browse the pattern collections users have shared on various resource and community websites. Due to the overall lack of organization at many of these sites, it may take a while to find what you're looking for, but the upside is that you'll probably come across other interesting projects, making it a worthy undertaking. Check out a few of the best collections in the section below. Daisy Cottage Headbands: You'll find 15 free headband patterns at this website. Crochet Pattern Central: With access to hundreds of well-written patterns for hair accessories, you'll have no trouble finding the perfect project. All Free Crochet: This site offers fewer patterns, but the quality is typically very good to excellent. If you'd rather spend your time crocheting instead of searching through hundreds of patterns, take a look at the links to specific ribbon crocheted headband projects below. Better Homes and Gardens Ribbon Weave Headband: This easy and free pattern from the experts at Better Homes & Gardens yields an elegant and classy crocheted headband with interwoven ribbon strands. Skinny Headband: Use this simple pattern to made thin headbands in your favorite colors. Travel Headwear Plain Headbands: Yes, they're plain but the design of these headbands make them perfect for decorating with ribbons and bows. Signing up for online communities that focus on crocheting tips, tutorials, and free pattern sharing is a wonderful way to find headband patterns that aren't always available to the public. Here are a few good crochet communities to consider. Craft Bits: This site offers craft and crochet patterns as well as friendly advice from other crafters. JPF Crochet Club: Here, you'll find an assortment of free patterns submitted by users and administration. Ravelry: You'll join over 600,000 other crochet enthusiasts with a free membership to Ravelry. The community features a pattern database and organizational tools for your projects. Even if you've searched endlessly and still haven't figured out how to make ribbon crochet headbands that you like, don't give up on the idea. Use the resources you find here and elsewhere to design your own ribbon-accented headband patterns. For more information about crochet projects, browse the articles below.